According to Gartner, the worldwide public cloud services market is projected to grow 16.5 percent in 2016 to total $204 billion. Looking at the sea of change in IT, one can easily say cloud adoption is growing like never before. Cloud Solution Providers (CSPs) are focusing on strategies to improve cloud ROI and mitigate security concerns. From Amazon Web Services to Salesforce, the big cloud players are offering users best-of-breed business and IT portfolio analysis leading to risk-calibrated recommendations on cloud leverage to increase business agility. Application and platform architecture has also become an important topic for CSPs owing to optimal cost-sensitive design with high availability features along with cloud service brokerage. Users are also looking forward to unified cloud management and monitoring frameworks to seamlessly manage workloads running in hybrid environments, typically in complex service deployment models with a mix of onpremise and private/public assets. Certain trends in cloud architecture such as hyper-convergence and containerization have become common as the next-generation solutions are demanding a next-generation cloud. In the last few months, we have analyzed hundreds of Cloud Solution Providers and shortlisted the companies that are at the forefront of tackling challenges in the cloud space. A distinguished panel comprising of CEOs, CIOs, and analysts including CIO Review’s editorial board has selected the list of 20 Most Promising Cloud Solution Providers in 2016. The listing provides a holistic view into how the solutions for Cloud sector are put into use. This helps you to gain a comprehensive understanding on how the solution provider will optimize your processes. 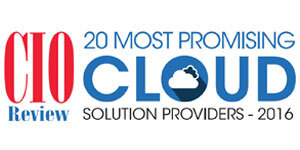 We present to you 20 Most Promising Cloud Solution Providers 2016.